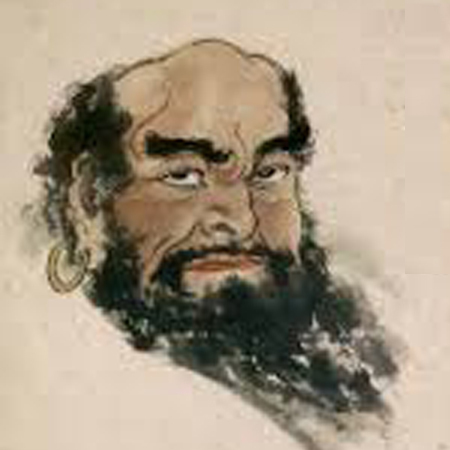 Master Bodhidharma was an Indian monk who lived during the 5th or 6th century. As directed by his master, the Twenty-seventh Chan Patriarch Prajnatara, Master Bodhidharma went to China to transmit the Chan teaching and the Heart Imprint. He is considered the First Patriarch of Chinese Chan. After visiting Emperor Wu of the Liang Dynasty, Master Bodhidharma traveled to northern China and meditated in a cave near the Shaolin Temple for nine years and later passed down the Chan lineage and the Heart Imprint to the Second Chinese Chan Patriarch Huike. He also began the physical training of the monks of the Shaolin Temple that led to the creation of Shaolin Kung Fu.